Keep an inventory of your coin or token collection. Is there a better alternative to iCollect Coins & Tokens? Is iCollect Coins & Tokens really the best app in Inventory category? Will iCollect Coins & Tokens work good on macOS 10.13.4? 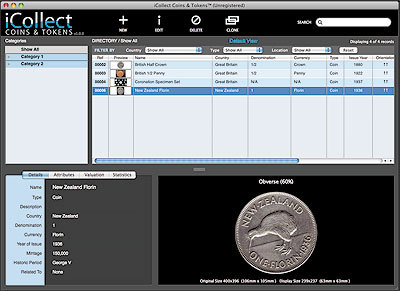 iCollect Coins & Tokens is an easy to use, yet powerful inventory tool for collectors of coins, tokens and other forms of currency. iCollect Coins & Tokens is the perfect solution for all collectors from beginners to professionals. There is simply no other software on the market that can match iCollect Coins & Tokens for its ease of use and practical features. Vast array of fields available. Saved views for viewing flexibility. Export directory listings to other programs. iCollect Coins & Tokens needs a review. Be the first to review this app and get the discussion started! iCollect Coins & Tokens needs a rating. Be the first to rate this app and get the discussion started! Backup/Restore facilities to ensure data safety. Simple to set up, even easier to use. Demo version limited to five records.